As Latin Americans seem to be taking over professional baseball in the U.S., Snaider Torealba is at Arizona Western College with hopes of being part of that trend. Torrealba, 20, was born and raised in Barquisimeto, Venezuela, alongside his older sister. At the age of 8, he began playing baseball, which has been his life ever since. Even though his dad got him into the sport, his mom was the one who took him to practice every day after school, nor did he ever miss one of the weekend games. As a teen, he started playing for academies in Venezuela, and eventually he was recruited to AWC. Several Decembers ago, the organization CJ Becas came looking for talent at Torrealba’s academy. This group is known for searching out talent in Latin America to send to U.S. colleges and universities. The group identified and ranked about 20 Venezuelan players and ranked them, then made videos displaying their skills, which would be sent to schools in the U.S.
Torrealba received a variety of offers, but there was a problem. He couldn’t speak English very well. Many schools tested him to see how well he knew English, except one. When he accepted a full scholarship at AWC, his family was proud of him for being a step closer of reaching his goal. They were supportive throughout the process and wanted the best for him, but they knew that if he left things wouldn’t get any easier. Even so, Torrealba and his family communicate through video and phone calls daily. He still gets emotional since he can’t see them in person. If he stays in his room, he starts feeling lonely and remembers his family situation. His teammate and roommate, Yodelvy Merendez, goes through the same thing. Although situations are getting better with time, Torrealba has also had his fair share of struggles because of the language barrier. Thankfully, certain people have helped him along the way, such as his now girlfriend, Aidaly Quintana. Many things are going on in Torrealba’s life, but he knows why he’s here. His dream has always been to play professionally in the Major Leagues. Growing up, his role models in baseball were fellow countrymen Asdrubal Cabrera and Omar Vizquel. He loves the New York Yankees and hopes to be part of the greatest team in U.S. sports history, but he would be grateful to play for any major league team. 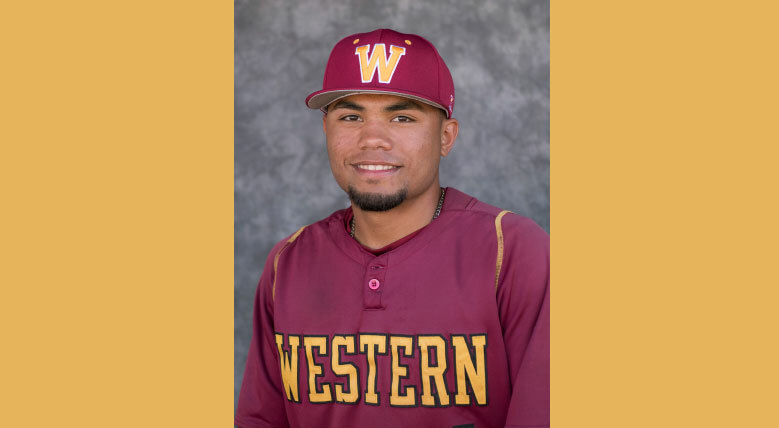 Torrealba is currently in his sophomore year at AWC, where he wears the number 1 on his back, and he is one of the team’s most consistent and durable players. As of April 15 of this year, he is second in runs and second in stolen bases. Also, in the era of the strikeout, Torrealba has managed an impressive 25/32 strikeout-to-walk ratio, making him the least struck-out player. One thing Torrealba can improve on is his defensive numbers. He has 21 errors, but is second in total chances (TC), behind the first baseman. Despite his fielding struggles, though, he loves playing middle infield and doesn’t have a position change in mind. Although the AWC players come from various countries and cultures, they end up being like family. Some spend more time with their teammates than with their own families. The Spanish-speaking players tend to hang out with each other, but when the game starts they all speak the same language – baseball. Torrealba will do anything in his power to become a professional baseball player. He’s “grateful and lucky” that a country like the U.S. opened its doors to him after growing up in a country with government and social problems. “In the future, if everything works out, I can give my family a chance to immigrate here in search of a better life,” Torrealba said. As for Torrealba’s next step, he says he has offers to go play for other colleges, but right now he’s focused on AWC. Hopefully, within two years he’ll get his draft notice and be off to the big leagues.